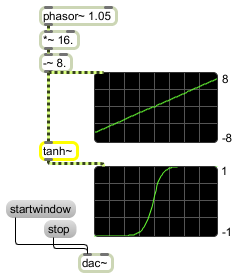 tanh~ takes a signal input and outputs the hyperbolic tangent function (tanh (x)) for that input signal. signal Input to a hyperbolic tangent function. signal: The hyperbolic tangent of the input.